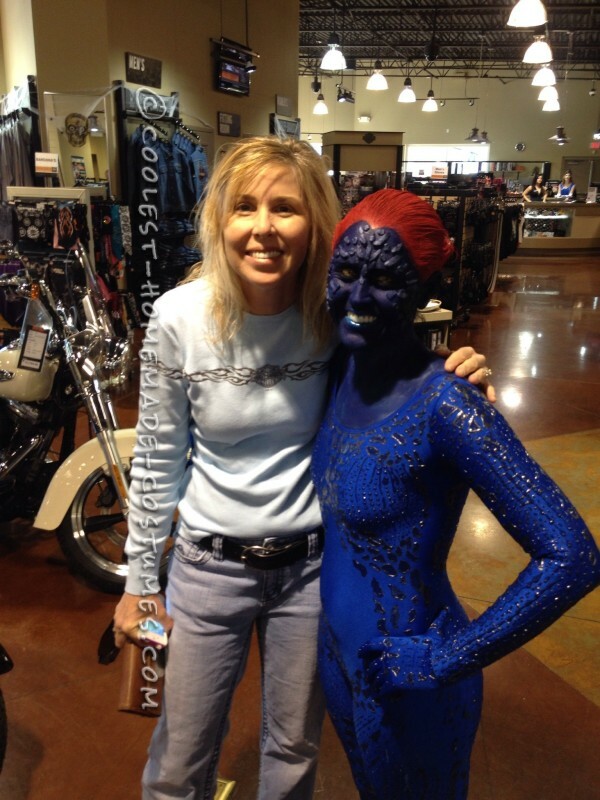 The Mystique Costume That I Spent 4 Months Planning For! 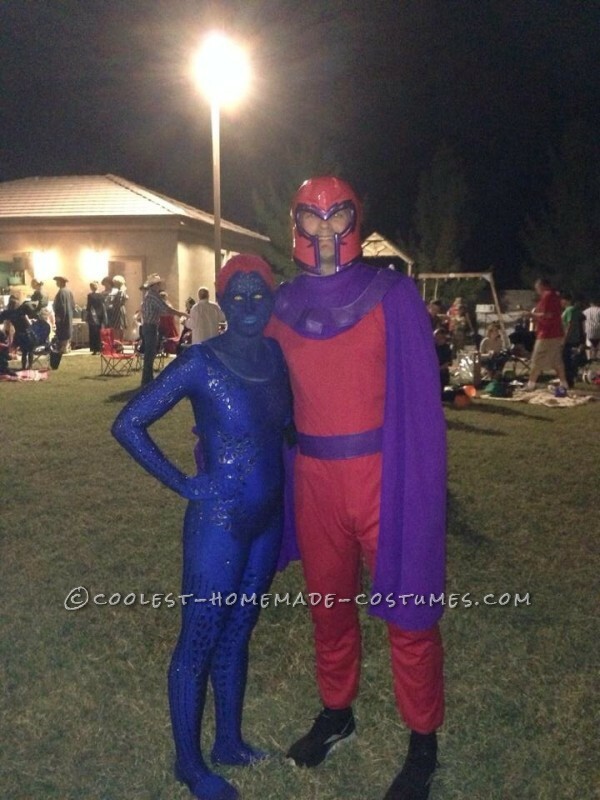 First off, I have always wanted to do this costume…so I started planning in June. I came across this website and read through all the Mystique entries to get ideas and to combine what I thought were some of the best techniques. I also viewed several YouTube videos on makeup ideas and techniques on how to complete the look. I purchased a royal blue dance leotard online as well as matching socks and gloves and once I received that I purchased a bunch of fabric paint from a craft store. 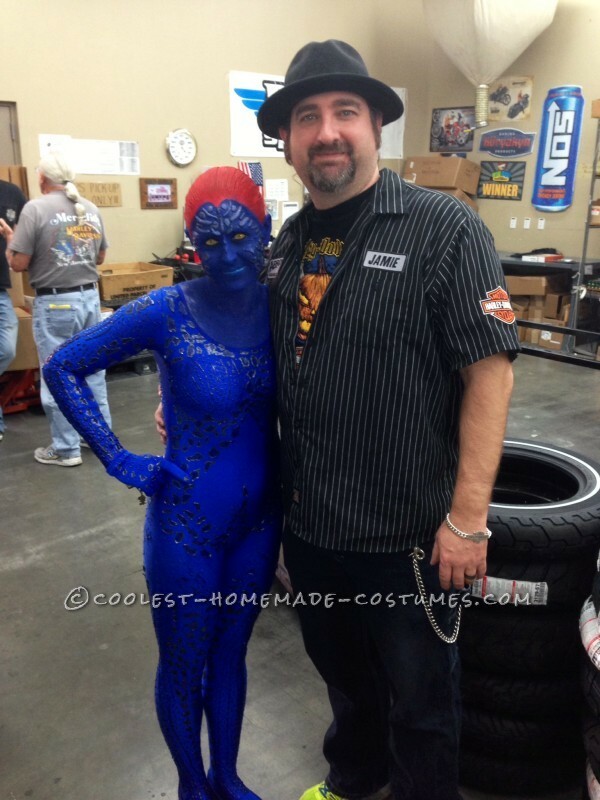 I printed several photos online of Mystique hoping to get a close up of her scale pattern. From looking at photos I then hand painted scales with the fabric paint over the entire leotard…this took over 14 hours over a period of a few weeks because it needed to dry in areas before I could work on the rest. After that I purchased yellow prescription lenses online for the eyes. I have natural long blonde hair so my biggest worry was how to pull off the red hair! I felt a wig wouldn’t give the costume the right look so I researched different spray hair colors and decided on Jerome Russell’s red hair spray color because reviews were good for it washing out. For the face and hair I’m glad I did several trial runs because I wasn’t happy with how the first couple times turned out! On my big day…the day of my work Halloween contest…I got up at 1:45 am to start getting ready. I put a ton of gel in my wet hair and blow dried it to slick back and then fastened it in a low bun. I then went outside and sprayed it with the red hair color. 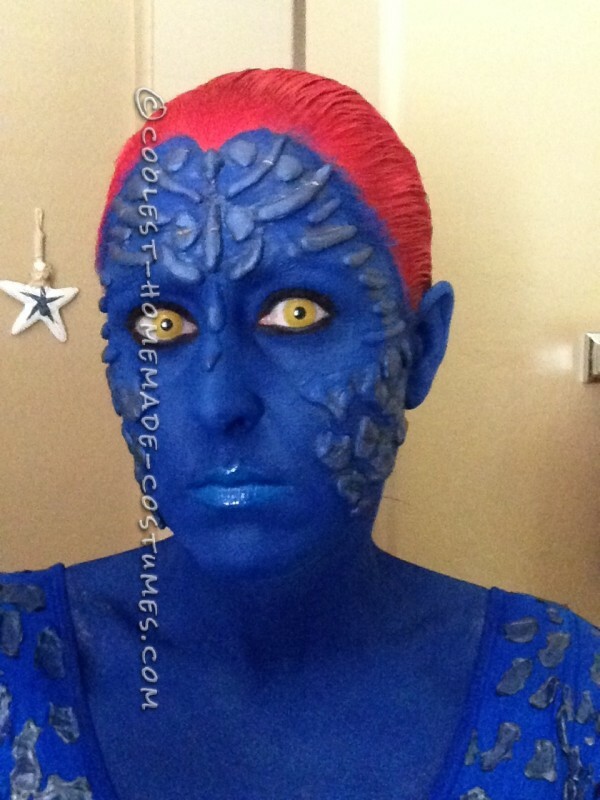 I had shaped scales for my face with fake flesh and play-doh that I had painted blue and pre-dried. I attached those to my face with liquid latex and let that dry a good half hour. 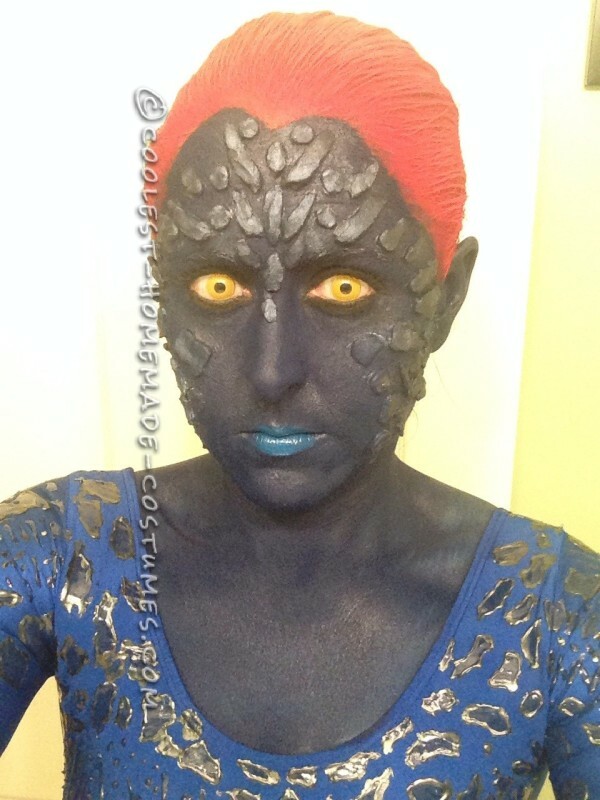 I then applied a dark blue face paint by snazaroo all over my face, ears, upper body and let that dry. I went over the scales with a shimmery metallic blue eye shadow and then popped in my yellow contacts. I used a dark eye shadow on my lids and used a yellow eye liner and black eyeliner to frame my eyes. I then applied mascara and sprayed my face with a makeup sealer. The last touch I added was a blue lip gloss that I found online from the UK by Sleek Looks. I have never received so many compliments on a costume nor had my picture taken so much! Everyone wanted a photo with me and I still have people asking me how I pulled off that costume! I also won first place in the costume contest that day! 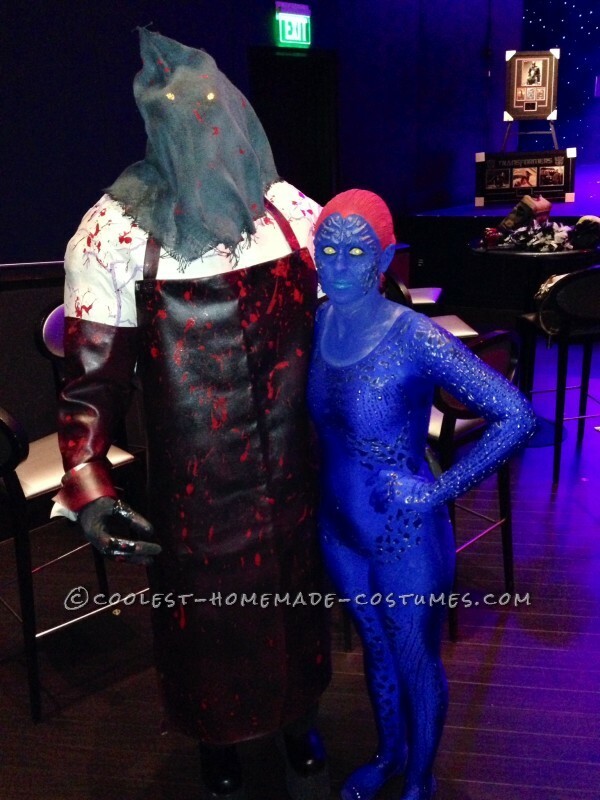 It was overall a rewarding experience making my own costume and having it turn out the way it did! It will be a hard costume to top! 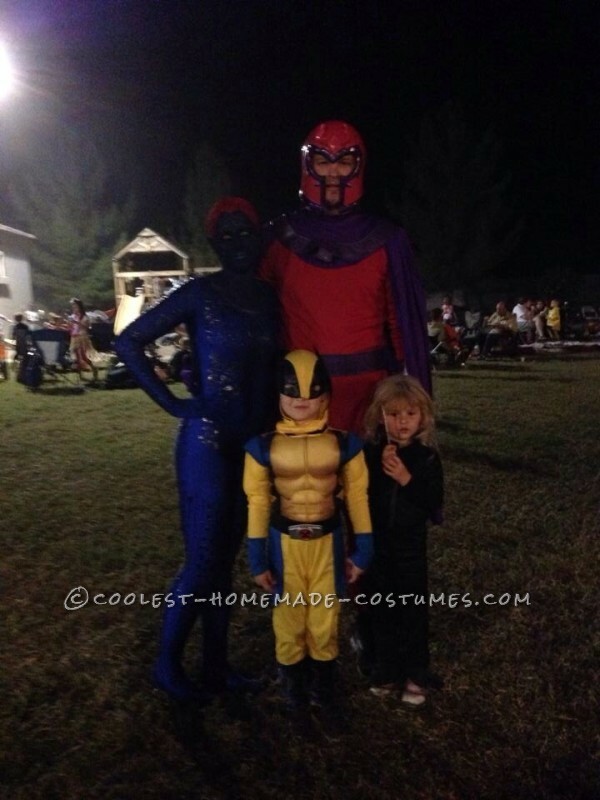 I ended up going to a party after work as well and the rest of my family came as other X-Men characters…my husband was Magneto, my son Wolverine, and my daughter Storm! Once again I have never received so many compliments and our family costume was a huge hit!